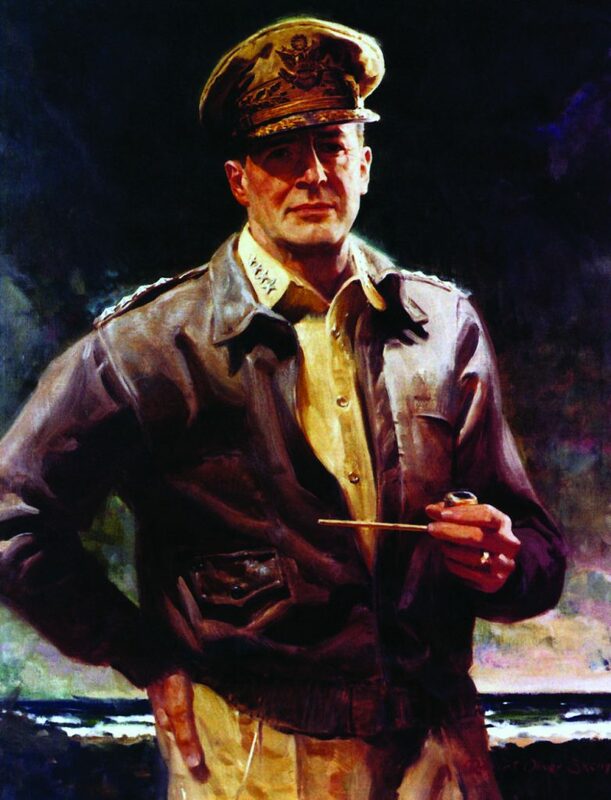 Douglas MacArthur was born in Little Rock, Arkansas, on 26 January 1880. He graduated first in his class from the United States Military Academy in 1903. Commissioned a second lieutenant, he served in the Philippines for a year. He was promoted to first lieutenant in 1904. From 1904 to 1906, he was an aide to the commander of the Pacific Division, his father Lieutenant General Arthur MacArthur. He next served as an aide to President Theodore Roosevelt and taught at the Army Services School at Fort Leavenworth, from 1908 to 1912. In 1911, he was made a captain and served on the General Staff from 1913 to 1917. In 1915, he was promoted to major and took part in the Vera Cruz operation. In 1917, he was promoted to colonel and made the chief of staff of the 42d (Rainbow) Division in France. Promoted to brigadier general in the National Army 1918, he fought in the Marne operations, commanded the 84th Infantry Brigade in the St. Mihiel and Meuse-Argonne offensives, and led the 42d Division in the Sedan offensives. He then served with the Army of Occupation and was superintendent of the U.S. Military Academy from 1919 to 1922. In 1920, he was made a brigadier general in the Regular Army. He married Louise Cromwell Brooks in 1922 and was promoted to major general in 1925. MacArthur then successively commanded the District of Manila, the Fourth and Third Corps Areas, and the Ninth Corps Area. In November 1930, he was promoted to temporary general and served as Army Chief of Staff from 21 November 1930 to 1 October 1935. As Chief of Staff, he highlighted Army deficiencies in strength and materiel, established an Air Force headquarters, and supervised the eviction of the “Bonus Marchers” from Washington, D.C. After his tour as Chief of Staff ended, he resumed his permanent rank of major general and became a military advisor to the Philippines. In 1937, he married Jean Marie Faircloth, and then retired from active service. In 1941, he was recalled to duty as a lieutenant general and commanded the U.S. Army Forces in the Far East. In 1941, he was made a temporary general and was Supreme Allied Commander in the Pacific from 1941 to 1945. In 1944, he was made a temporary General of the Army and awarded the Medal of Honor for the Philippine defense. In 1945, MacArthur was Supreme Allied Commander, Japan and a year later was made a permanent General of the Army. In 1947, MacArthur was named commander in chief, Far East Command. He led the United Nations Command in the Far East in the outbreak of the Korean War, and commanded the landings at Inchon. President Truman relieved him of command in April 1951. MacArthur died in Washington, D.C. on 5 April 1964.